LITTLE library users in Reading are in for a treat, with the official launch of the town’s toy library at its new central location. The toy library will be officially launched this week on Thursday 31st January at 11.15am by the Mayor of Reading, Cllr Debs Edwards and Cllr Sarah Hacker, Reading’s Lead Member for Culture, Heritage and Recreation, supported by local children and a fairy princess. The celebration will also include a castle shaped cake! As well as families, registered childminders, early years settings and schools in Reading are also encouraged to make use of the toy library. 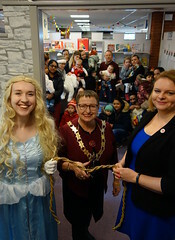 Cllr Sarah Hacker, Reading’s Lead Member for Culture, Heritage and Recreation, said: “I’m absolutely delighted to celebrate the launch of the new toy library at Reading Central Library in its impressive new castle themed home. “Buying new toys can be difficult and expensive for parents. The toy library offers an ideal solution and is a fantastic resource to keep children of all ages active with new toys on a regular basis, or to hire large toys for a children’s party, for a minimal cost. The giant toys need to be borrowed and returned to Central Library, but most small or large toys can be requested, collected and returned to any Reading library. Media opportunity: The media are invited to the launch of the new central Reading toy library on Thursday 31st January at 11.10am. The original Toy Library was launched in March 2003 by its patron, Martin Salter MP.